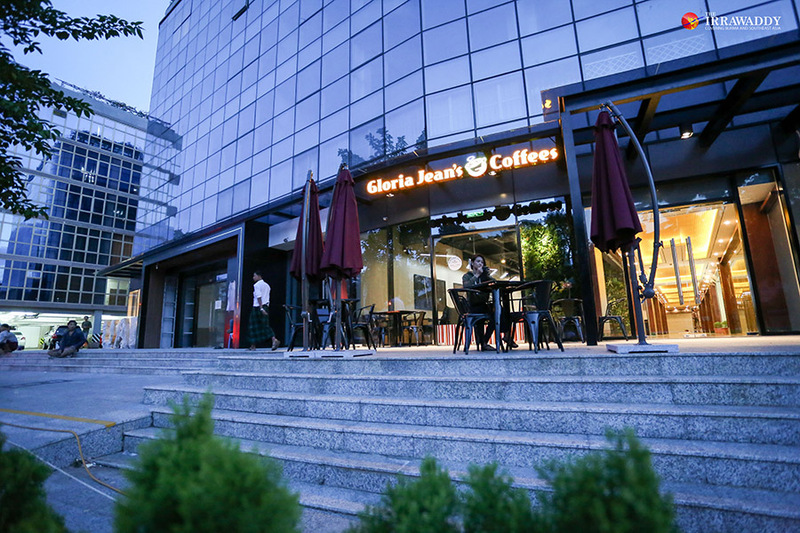 Myanmar’s sixth Gloria Jean’s outlet at the Time Link in Yangon. YANGON — The rainy season is upon us, which means you can finally phase out your spring clothes and replace them with a few stylish sweaters. And you’ll also need a cozy place to hang out, whether it’s alone or with friends. At this time of year it rains in Yangon almost every day. Recently a friend and I agreed to meet and catch up on the weekend, and we discovered that a new Gloria Jean’s outlet opened a few weeks ago. 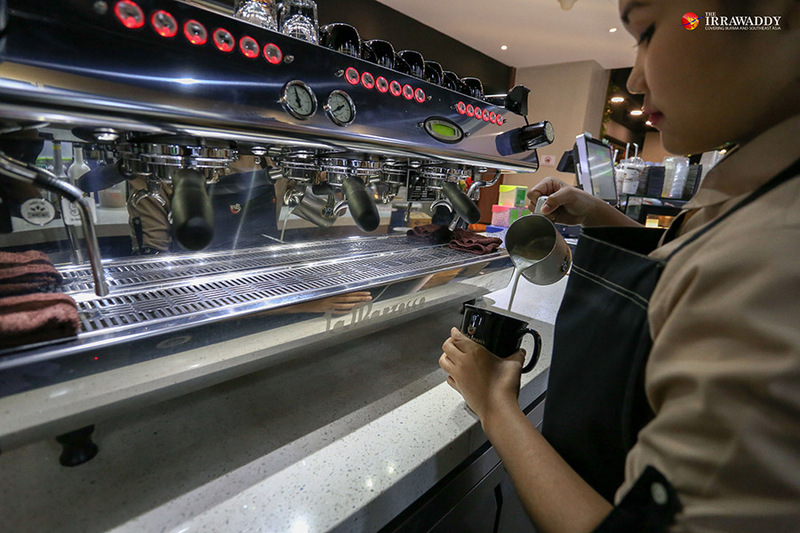 A barista makes a coffee at Gloria Jean’s Coffee Myanmar. 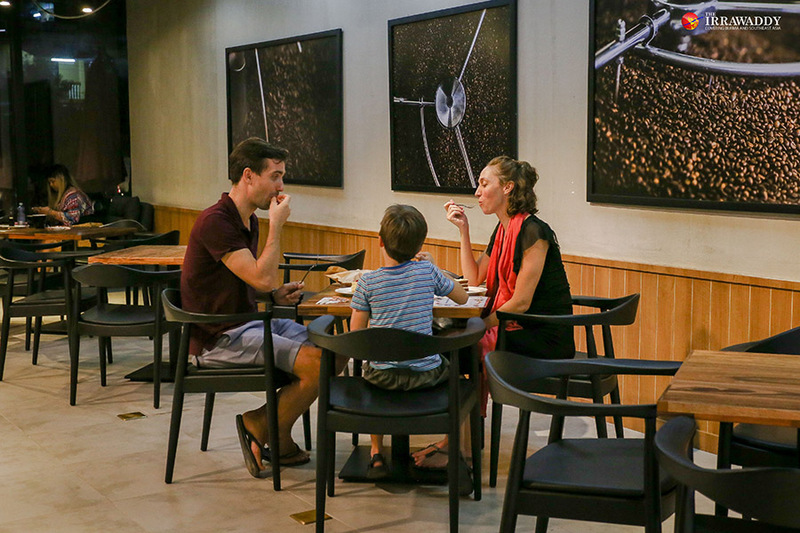 The Australian coffee-shop chain Gloria Jean’s (GJC) opened its sixth outlet in Yangon on May 17 at The Time Link on Yangon’s Dhammazedi Road near Dhammazedi Point. The Time Link is a new building and not many shops have opened there yet. When we went, it was around 6 p.m. and the coffee shop was totally quiet; we were the only customers. Possibly people just aren’t aware of the new location yet. There is seating both inside and out, overlooking the street. We chose to sit inside because my friend and I wanted some chitchat time to ourselves. GJC Myanmar now has a total of eight outlets nationwide, at Myanmar Plaza, Yangon Domestic Airport Terminal 3, Junction City, Star City, the mini-rest stop at Mile 76 on the Yangon-Naypyitaw Highway, Junction Square, Time Link on Dhammazedi, and The Move Mingalar Mandalay. 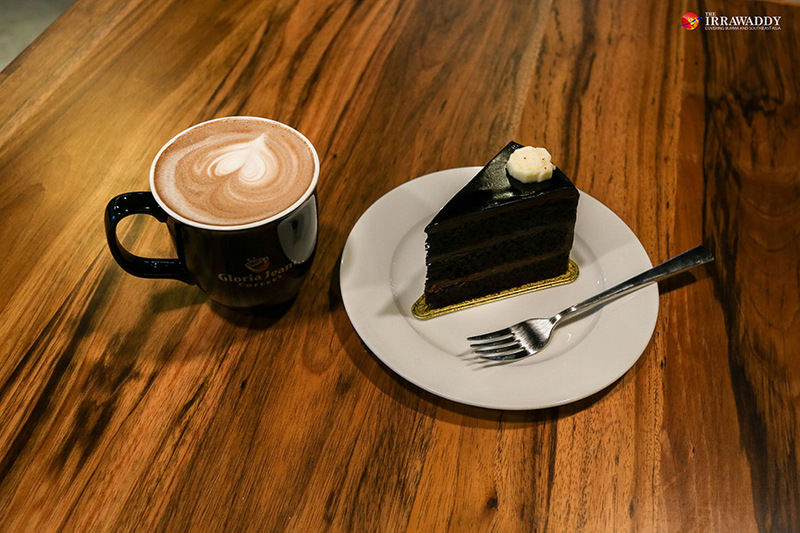 A hot chocolate with dark chocolate cake. As a coffee lover, I was already a fan of GJC, having spent a lot of time hanging out at the Myanmar Plaza outlet. I like the strong flavor of their coffee, and their berry smoothies are perfect for sunny days. Unfortunately, my friend isn’t a coffee drinker, so she ordered a hot chocolate and I ordered my favorite hot cappuccino. To help you order your drink, there is a size chart illustrating the small, regular and large beverages. We both ordered regulars, which were quite generous. We needed something sweet to go with our drinks, and ordered the dark chocolate slice cake. The drinks and cake were around 5,000 kyats each, including tax. We didn’t need to wait long; the coffees and cake arrived in a short time, preceded by their delicious aroma. It’s funny how your day seems to improve with that first sip of coffee. Outdoor seating at Gloria Jean’s Myanmar’s Time Link outlet. The cappuccino was creamy but still strong; personally I love my cappuccino without sugar, because I like to savor that strong, bitter, original coffee flavor. And the cake was amazing. Both the food and drink had strong, rich flavors — kind of bittersweet — but left me wanting more. My friend also enjoyed her hot chocolate, which she said was quite sweet. I loved watching the rain fall outside the shop and we talked about a lot of things. Good coffee at a new cozy place in town — it made for a really a great weekend. He added that GJC uses only single origin and specialty blends imported directly from the company’s roasting facility in Australia. “GJC outlets across the globe use the very same ingredients to ensure the quality and consistency they serve to customers,” Latt said. Guests enjoy their evening at Gloria Jean’s. He added that, “One of our strengths is the quality and taste of our coffee, which many of our customers here have developed a preference for. We also listen to our customers and have identified areas to improve on.” Gloria Jean’s Coffees opened its first store in Australia in 1996 and has become one of the biggest coffee brands in its home market. Today, it has coffee houses in more than 40 countries with a total of more than 1,000 locations.